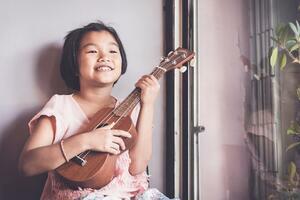 A ukulele is a portable, approachable, and easy instrument that makes learning music fun! 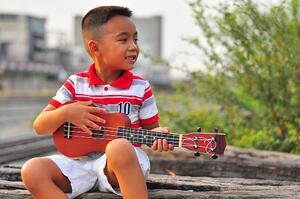 While ukuleles are especially advantageous for younger learners, they're great instruments for any age. They're less expensive than guitars. The average cost for a guitar is $300 to $500. The average cost of a ukulele is $50 to $300, depending on the quality and size. This means it's a great instrument to try if you aren't sure about your kid's talent or interest in music. You get to expose them to all the positive benefits of learning an instrument without paying an arm and a leg for an instrument which might just gather dust in the corner. They allow you to play any kind of music you want. Do you have an image of a ukulele as an instrument which only handles folk music? While it got its roots in Hawaii and has certainly been used for a great deal of folk music, you can play any song you want on the ukulele. You can even play heavy metal! The basics don't take long to learn. Ukulele is great for learners who are eager to start making music right away. It has just four strings compared to a guitar's six, so managing chords becomes far easier. Your child could be playing basic songs after just thirty minutes of training. He or she will need more time to really master the instrument, but they'll get an immediate boost in their confidence. Ukuleles offer a fine foundation for other stringed instruments. Once it's clear your child is dedicated enough to the art of making music to start thinking about making bigger investments you can try a guitar or a bass without worrying that you've wasted your time on the ukulele. The skills your child learned will still be there, and they'll provide a fantastic foundation for picking up other stringed instruments quickly. Of course, you don't have to transition. Many ukulele players become dedicated to the ukulele for life! You've already seen two of the differences: cost, and the number of strings. But there a few more differences between these instruments. First, the fret board on a ukulele is smaller. That makes it more manageable for young children, and people with smaller hands. Second, the strings are a little easier on the hands than a guitar string. Guitar can be painful to learn, at least until the musician develops the proper callouses. This can discourage a lot of learners before they even get started. Ukuleles are usually pain free, but help students develop calluses anyway. This means if a player does decide to transition to the guitar later they'll have a bit of an edge, as his or her fingers will be a lot tougher than someone who is totally new to stringed instruments. We encourage our ukulele students to perform just like we encourage all our students! We have free recitals twice a year. Of course, don't be surprised if your child starts "performing" far earlier. It's not uncommon to see kids breaking out the ukulele to entertain classmates or family members. This is a great way to encourage them in the learning process and to grow their confidence with the instrument! Ready to get your child started? Just follow the steps below.